There are 10 species of bats that exist in New Hanover and surrounding counties. All 10 of these species eat insects. Bats are nocturnal mammals: they hunt for insects at night and they are furry and warm-blooded. All 10 species of bats mentioned above use echolocation to hunt. Echolocation is a method of navigating using sound waves instead of light. Bats emit calls (sounds) to their environment and then listen for the echoes. Based on how long the echo takes to get back to their ears and how intense the sound is when it gets to their ears, bats can navigate their surroundings extremely well- even in complete darkness. Bats' echolocation is so fine tuned that they can easily pick out a small beetle from a tree with rough bark. Other animals that use echolocation are whales and dolphins. 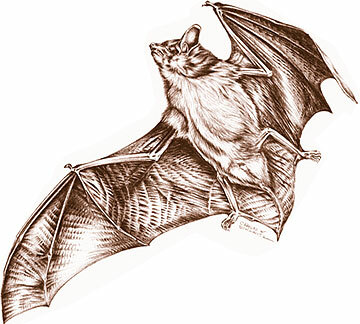 Illustration of bats next to bat box. Although many bats use echolocation, it is a common misconception that they are blind. In fact, in the daylight, many bats see just as well as humans do! Some bats are colonial and some are solitary. Colonial bats like to hang out with each other and roost (sleep) together. Solitary bats are just as the name implies- they usually only get together to mate or raise young. In the wild, bats often roost in caves, holes in trees, or under peeling tree bark. Like birds, some bats migrate. Although they can travel as far as 800 miles for migration, most bats simply migrate a few miles in search of a frost-free roost for hibernation. Bats hibernate for much of winter, like other mammals. Bats are great to attract to your backyard. A single bat can eat 3,000-7,000 mosquitoes in one night. Bat guano is also excellent fertilizer. Many people do not want bats in their backyard because they are scared of them, but there is no more reason to be scared of bats than there is to be scared of a mouse or a raccoon. Bats get a bad reputation from most movies and folklore. In New Hanover and surrounding counties, we have NO vampire bats. All the bats that exist here mostly eat insects that will bite you or destory your garden/property (mosquitoes, moths, beetles, etc) and so they are very beneficial. Another misconception is that all bats have rabies. This is not the case. Bats contract rabies just like a raccoon, opossum, or your dog might, and the numbers of bats with rabies are not significantly different from these other animals. Also, if you feed birds and are worried about bats interfering with their airspace- don't! Birds and bats become active at different parts of the day. When birds wake up, bats go to sleep and vice versa (with the exception of some birds like Whip-poor-wills, Chuck-Wills-Widow, and owls). After all, they existed in nature together here before people ever arrived. 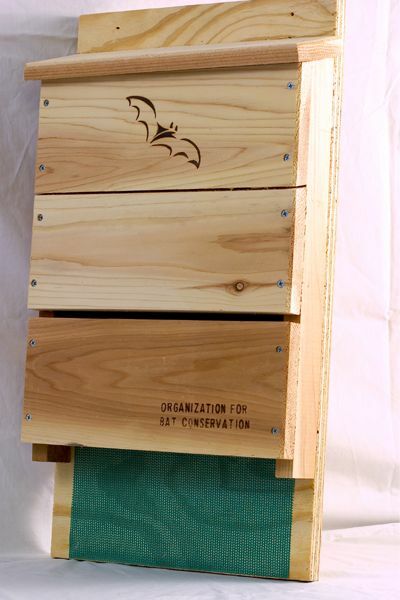 Official bat house of the Organization for Bat Conservation. Organization for Bat Conservation (http://www.batconservation.org/) : This organization specializes in bat conservation, education, and research. If you would like to do more to protect bats, visit their website and learn more! Wild Bird & Garden's List of Bats of Southeastern North Carolina: Learn what species live in our area. Bat Conservation International (http://www.batcon.org/): Another worldwide organization specializing in bat conservation, education, and research. If you would like to do more to protect bats, visit their website to learn more!